(CNSNews.com) - The federal government spent $2,198,468,000,000 in the first six months of fiscal 2019 (October through March), which is the most it has spent in the first six months of any fiscal year in the last decade, according to the Monthly Treasury Statements. Fiscal 2009 was the fiscal year that began with President George W. Bush signing a $700-billion law to bailout the banking industry in October 2008 and then saw President Barack Obama sign a $787-billion stimulus law in February 2009. At the same time that the Treasury was spending the most it has spent in ten years, it was also taking in less in tax revenue than it has in the past five years. In the October-through-March period, the Treasury collected $1,507,293,000,000 in total taxes. The last time it collected less than that in the first six months of any fiscal year was fiscal 2014, when it collected $1,420,897,880,000 in constant March 2019 dollars. 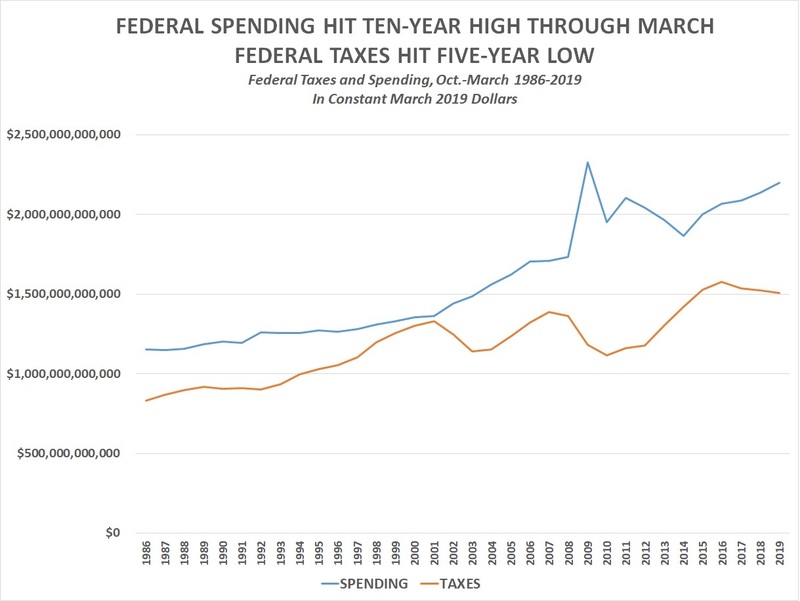 The difference in the federal taxes taken in and the spending going out resulted in a federal deficit of $691,174,000,000 for the first six months of the fiscal year. During those six months, the Department of Health and Human Services spent the most money of any federal agency with outlays of $583.491 billion. The Social Security Administration was second, spending $540.426 billion. The Department of Defense was third, spending $325.518 billion. Interest on Treasury securities was fourth, coming in at $259.687 for the six-month period. Both individual and corporation income taxes were down in the first six months of this fiscal year compared to last year. 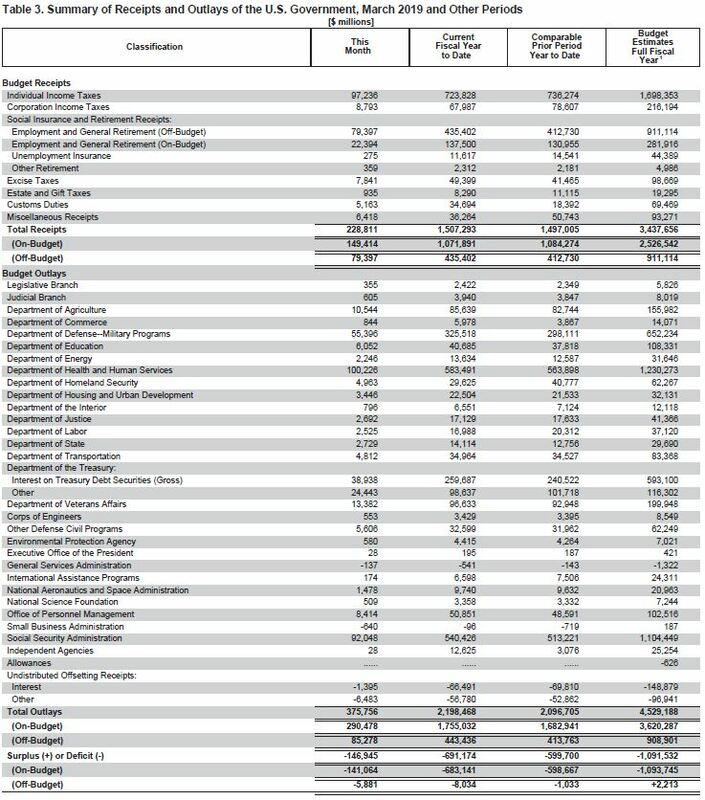 In the first six months of fiscal 2018, the Treasury collected $736,274,000,000 in individual income taxes (in constant March 2019 dollars). In the first six months of this fiscal year, it collected $723,828,000,000. In the first six months of fiscal 2018, the Treasury collected $80,071,070,000 in corporation income taxes (in constant March 2019 dollars). In the first six months of this fiscal year, it collected $67,987,000,000.